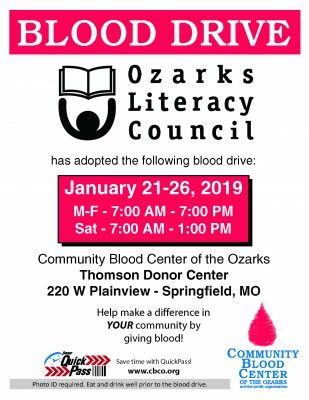 Ozarks Literacy Council has adopted a blood drive at Community Blood Center of the Ozarks! Come by CBCO’s Thomson Donor Center, 220 W. Plainview Road in Springfield, Missouri, January 21 – 26, 2019, to donate blood. 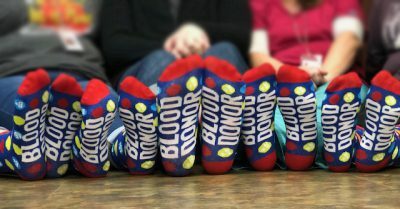 Participants receive a fun, colorful pair of blood-type socks. Did you know that CBCO is the sole provider of blood and blood products for 40+ hospitals in southwest Missouri, northwest Arkansas, and southeast Kansas? That means your donation is helping friends, neighbors, and loved ones in need. The mission of Ozarks Literacy Council is to raise awareness and promote literacy by providing one-on-one tutoring to improve reading and writing skills, and provide education about the importance of reading. Learn more about this organization by visiting its website HERE. Follow OLC on Facebook, Twitter, and Instagram. Thanks, literacy lovers and Lifesavers! Complete our QuickPass on your smartphone, tablet, or computer the day of the blood drive and when you arrive at CBCO, you’ll skip registration. What a time-saver!